Senator Sanders, center, is joined by Assembly Assistant Speaker Felix Ortiz, left, and other supporters of the Green New Deal. ALBANY, NY - New York State Senator James Sanders, Jr. (D-Queens) and Assembly Assistant Speaker Felix Ortiz (D-Brooklyn) held a press conference today in the State Capitol announcing the introduction of a "Green New Deal for New York" bill (S.2878-A/Sanders Same as A.5334/Ortiz). This bill is the first Green New Deal legislation in the nation to be introduced on either the state or federal level. It was filed on January 30th. Sanders commended Congresswoman Alexandria Ocasio-Cortez for her leadership on pushing for a New Green Deal in November and this bill is largely modeled on her proposal. He said he supports her recent joint resolution with United States Senator Edward Markey in Congress calling for a Green New Deal, which has attracted significant support. “Like the New Deal launched by a former New York governor in the 1930s, President Franklin Delano Roosevelt, a Green New Deal for our generation can result in a new era of economic transformation to promote economic growth and jobs,” Sanders said. • Every major report on climate change concludes that the low income and communities of color will be the most impacted by climate change. Assistant Speaker Felix W. Ortiz (D-Kings) is proud to be the Assembly Sponsor of the Green New Deal for New York (A.5334/S.2817-A). “Cities across New York State have seen and felt the severe destruction caused by global warming and environmental degradation on a smaller scale caused by pollution in our communities that is making our air hard to breathe and our children sick," Ortiz said. The Sanders-Ortiz bill would establish a Green New Deal for New York Task Force consisting of nineteen voting members. The Task Force would develop a plan for New York State to become greenhouse gas emissions neutral by 2030 by transitioning from a fossil fuel-based economy to one based on one-hundred percent clean renewable energy. The purpose of the bill is to prevent the catastrophic consequences of climate change, promote economic growth and job creation, and provide a just transition for the benefit of all New Yorkers. Senator Jessica Ramos and Senator Rachel May spoke in favor of the Green New Deal for New York. Senator Kevin Parker, Chairman of the Senate Energy Telecommunications Committee, is a cosponsor of the Green New Deal for New York. “The New York Stare Council of Churches strongly advocates for the formation of an inclusive committee to craft a Green New Deal where we can address the damaging effects of climate change by massively investing in clean energy infrastructure while significantly increasing the number of good paying jobs," said the Rev. Peter Cook, Executive Director, New York State Council of Churches. “It’s time for New York to lead the nation with a Green New Deal that moves us off fossil fuels by 2030 – we no longer have time to waste on half-measures," said Alex Beauchamp, Northeast Region Director at Food & Water Watch. "Finally, courageous politicians like Congresswoman Alexandria Ocasio Cortez and NY State Senator James Sanders, Jr. are proposing responses to the climate emergency that could actually protect humanity and the natural world. It's a historic shift, and I am proud to endorse it," said Margaret Klein Salamon, PhD, Executive Director, Climate Mobilization, Brooklyn. “The Green New Deal proposed by Senator Sanders and Assistant Speaker Ortiz combines two critical goals: an emergency mobilization to transition off of fossil fuels to 100% clean renewable energy by 2030; and a commitment to environmental justice and a Just Transition, including a guaranteed job and support for universal health care," said Mark Dunlea, Attorney, Chair of the Green Education and Legal Fund. Dunlea first began campaigning for a GND for NY in 2010. 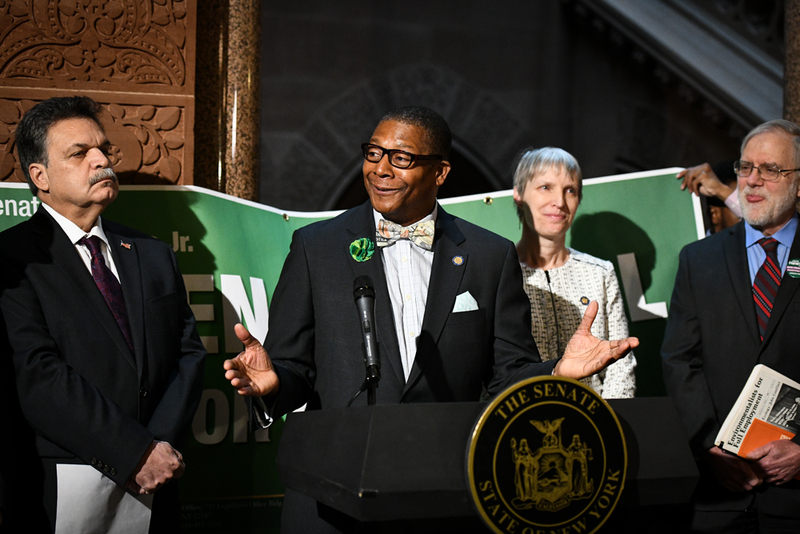 Supporters of the bill include (not a complete list): New York State Council of Churches; 350 NYC; 350 Brooklyn; Food & Water Watch; Bronx Climate Justice North; Climate Mobilization; Green Education and Legal Fund; North Bronx Racial Justice; Rochester People's Climate Coalition; Rochester Interfaith Climate Action; Color Brighton Green; Green Party of New York State; Mark Jacobson, PhD, Stanford University; Lester Brown, environmental analyst; and Peter Kalmus, PhD, NASA climate scientist.